This Forget-Me-Not flower illustration is so charming! It's from a vintage postcard. 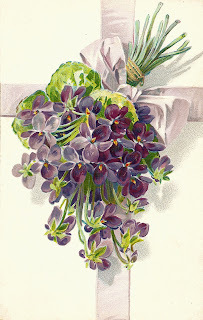 I love the lilac ribbon tied around the bunch of flowers! This would definitely make a wonderful decorative element on a gift tag or on the front of a greeting card. Enjoy!